In late August 1908, the young psychoanalyst Karl Abraham wrote excitedly to Freud. “Things are moving!” he enthused. “On the 27th the Berlin Psycho-Analytic Society will meet for the first time.” Indeed the city of Berlin’s creative energy appealed to talented urban newcomers like Abraham, and also Max Eitingon, both recently arrived from training in Zurich and both self-reliant Jews. As usual, Freud tempered his own enthusiasm but encouraged his protégés. “The chronicle of our undertaking is perhaps not always pleasant, but that may be true of most chronicles; it will yet make a fine chapter of history.” This is the chapter that Veronika Fuechtner, associate professor of German Studies at Dartmouth College, has attempted to deconstruct, an episode of urban history as rich in human despair and political aspersion as in cultural production. 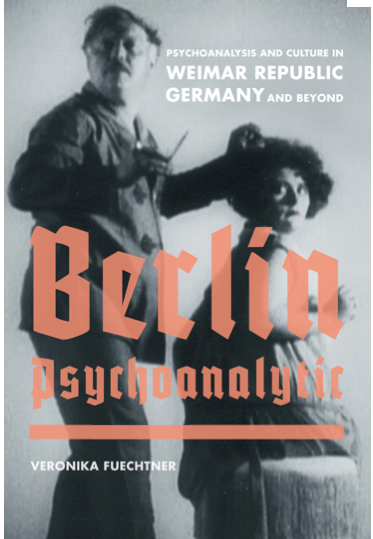 Fuechtner fastens her account of Berlin’s early twentieth-century élan to psychoanalysis, and she uses the word with postmodern multiplicity so that, in both its theory and its practice, psychoanalysis takes on the properties of a cultural meta-narrative all its own. As though ambiguity were its nom-du-père, the psychoanalytic discourse in Berlin is caught in a grim alternation between modernism and fascism; it rests where it can, landing interchangeably on the wildness of German culture, its battle cry of anti-Semitism, its intransigent Goethe-Schiller romance, and its cult of the scientific. How else could one explain the wild-eyed terror evoked in the photo, a still from Pabst’s 1926 movie Secrets of a Soul, that stares out at the reader from the book’s jacket cover? Having taken up the task, Fuechtner develops a layered representation of what she terms “Berlin Psychoanalytic,” a particular nexus of avant-garde intellectuals grappling, each in their own way, with the mind and its unconscious. Perhaps to parallel her sense of the era itself, she has created a work of history where the incidents are not set down in chronological order (though there is some of that) but as they occur within four case studies of two or three protagonists each, “talking to” each other. There is no dialogue per se. Instead each case study features a sort of modern German existential theme around which the narrative – which is actually interpreted research – is told. Alfred Döblin and Ernst Simmel “talk” about psychoanalysis, war neurosis and social misery in Case Study #1. Both men were physicians and psychoanalysts involved with the celebrated Berlin Psychoanalytic Institute (BPI), but Döblin was a novelist while Simmel was an organizer of people and programs. When Simmel died, Max Horkheimer remembered him, and Freud, as “relentless enemies of intellectual superstructures [and] the metaphysical hiding places of the mind.” Though Simmel holds a very small place in this chapter which is largely devoted to Döblin’s biography and dark novels, Döblin’s apparent fascination with precisely those “metaphysical hiding places of the mind” would have made for solid, politically-charged, exchanges between the two men. Instead the chapter details how Döblin applied psychoanalytic knowledge to evoke the chaos of human interiority in his novels Berlin Alexanderplatz and Two Girlfriends Commit Murder, and Fuechtner says that Döblin’s genre of psychological probing was specific to the “highly politicized psychoanalytic scene in Berlin (p. 64).” The literary analysis is well-crafted but the claims to Weimarian uniqueness of context leave me unconvinced. Georg Groddeck was a novelist too, interested in those levels of consciousness that are tinged with the kind of mysticism thought to preclude the psychoanalytic method. Fuechtner reviews his novels and his The Book of the It systematically for psychoanalytic content and adds the degree to which Freud was, or was not, interested in each. Further, she pairs Groddeck with Count Herman von Keyserling for the purpose of adding high culture and spirituality to the Berlin mix, itself a tour through sexuality (alternatively pro- and anti-feminist), eugenic thought, and ideological shifts toward and away from the Nazis. Along the way, we meet Karen Horney, Thomas Mann, Carl Jung, Frieda Fromm-Reichmann, among others, all of whose paths intersected with the Berlin Psychoanalytic Institute as they pursued psychoanalytic explanations of human conditions and reacted, perhaps to Groddeck’s displeasure, far more to Freud than to himself. Little of this mattered once Hitler took over. Felix Boehm and Carl Müller-Braunschweig, two analysts of the BPI Polyclinic (which is sorely underserved by the book, especially since Fuechtner wants to make a case for progressive politics at the BPI) who became Nazi collaborators and pretty much guided the endeavor’s aryanization, take second place to the pairing of Max Eitingon and Arnold Zweig. Their “dialogue” begins when both men emigrate to Palestine; Eitingon starts the Palestine Psychoanalytic Association and Zweig weaves in and out of his life, at times as confidant, as caretaker, as intellectual ally or opponent, as Jew in exile longing for a kind of community neither will ever find again. The book’s final transnational stop is New York where Karen Horney meets up with Charles R. Huelbeck (né Richard Huelsenbeck). The two had known each other in Berlin and reconnected through psychoanalytic institutions in postwar America. He was involved with Dada and drumming; she quarreled with colleagues but wrote persuasive arguments countering Freud’s biologism in women. Fuechtner has resurrected Huelbeck’s texts on sexuality, fascism, anti-Semitism and creativity to explore how he and Horney experienced exile and attempts at assimilation. “Berlin Psychoanalytic” is a serious book with good primary source research and its share of Foucaultian touches. The conceptual dialogues between psychoanalytically-oriented intellectuals portray a continent adrift in subversion and play, perhaps like Weimar Berlin or modernism itself, exhilarating at the time but lost to the forces of cooptation and repression. As the book draws to a close, its story seems nearly as anxious as the couple caught on the cover – a still from “Secrets of a Soul” (1926), the psychoanalytic film by GW Pabst that represents yet another expression of Weimar-era cultural and intellectual ferment. Elizabeth Ann Danto, PhD, is professor of social work at Hunter College and at the Graduate Center, City University of New York. Her book “Freud’s Free Clinics – Psychoanalysis and Social Justice, 1918-1938,” (Columbia University Press, 2005) was awarded the Gradiva Book Award and the Goethe prize. Her textbook on historical research in the social sciences was published by Oxford University Press in 2008. Dr. Danto writes and lectures extensively on the history of psychoanalysis as a system of thought and a marker of urban culture.